Another successful year was celebrated at this years AGM, followed by the annual post-AGM dinner. Several amendments to the bylaws were approved by majority vote to simplify the terms, appointment and election process of Directors and President. On March 1st, The Victoria Job Fair was held at The University of Victoria. The event was hosted by the JC-COC Victoria Branch and UVIC Career Club. A large number of Japanese International Students studying in Canada as well as other International students participated in the event. This event was geared to not only Japanese students preparing to return to Japan to pursue their careers but also those students interested in remaining in Canada to pursue a career locally. The event was met with warm responses from the participants and many found the information presented useful and relevant. 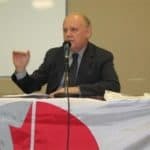 The event was divided into two sections; the first being focused on visa and immigration information for those interested in staying in Canada and the second being focused to those Japanese students looking to find and pursue a career in Japan. The first half of the Job Fair hosted speeches from the inspiration Burquitlam MLA Mr. Harry Bloy, ABIC Immigration Director Terry Kin (Immigration/Visa), BC Provincial Nominee Program Director Ms. Eileen Luni (Immigration Information), University of Victoria Co-Op Education Program Director (UVIC Co-Op Program Information). After the English presentations made in the first half of the event the second half was conducted in Japanese. The first speaker, Director of Jinsai Canada spoke on issues surrounding how to effectively find a career back in Japan as well as how best to highlight the students experiences in Canada. The speaker proved to be a great hit with all of the participants with his effective and to the point presentation. 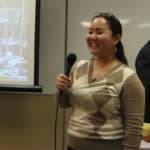 Ms. Shihori-Scott Moncrieff, Life Coach, spoke to students on often problematic issues for International students including how to build and retain a healthy self-esteem and how to avoid the issue of identity crises among International Students who study abroad for extended periods of time. Our last speaker who flew all the way from Tokyo to be with us this day was Mr. Nomura, representative from Mainavi. He spoke on a variety of issues including how students can prepare for careers in Japan and current trends in Japan. The day came to an end with a question and answer period. The participants noted that the Job Fair is an invaluable references and guidance to international students. Sponsor booths at the fair offered a drink refreshments, salon care and a variety of other refreshments throughout the fair. We would like to take this opportunity to thank our generous speakers and sponsors for all of their time and support. To address various issues surrounding the hot Real Estate Market in the Metro Vancouver, The JC-COC held a Real Estate Seminar on February 28th. The seminar was held at JTB International in Richmond, with a robust turn out of around 40 member and non-member participants. It proved a great opportunity to keep up with an array of Real Estate topics from a spectrum of specialists in the field. ith Gary Matson, JC-COC President, as MC for the event, the five speakers presented the following relevant topics. Gary Matson focused on the important aspects of the Contract of Purchase and Sale in a real estate transaction and what to look out for and prepare for upon completion of a purchase and sale. Mortgage specialist Heidi Hamano described the role and benefits of using a mortgage specialist when determining financing. Mortgage specialists can provide a wider variety of products at no cost to the Buyer. Matt Kadioglu spoke on how governmental regulations & planning can affect the value of real estate, while providing applicable examples from the Metro Vancouver area. Building upon past experience and statistics, Joji Murakami gave a presentation on which direction our local market is headed for. 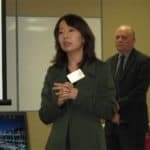 Yori Nakatani presented the basic types of real estate investments and investor profiles using actual examples from past sales in Metro Vancouver. The seminar came to a close with door prizes from our sponsors. The JC-COC looks forward to sponsoring many more seminars on relevant and practical topics for all of our memebers. On February 22nd, the Premiers Luncheon on the Provincial Budget was held at the Burnaby Hilton. 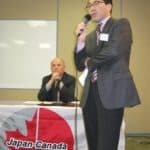 This prestigious event, hosted by The Burnaby Board of Trade with support from The Japan-Canada Chamber of Commerce welcomed turn out of roughly 300 people varying from BBOT members, JC-COC members, members from the business community and members from other Japanese business association (such as Konwakai, Kiyuukai). 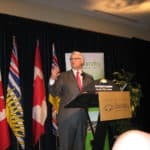 The Provincial Budget, which was released through the media earlier was outlined and commented on directly by our Premier, Gordon Campbell. Campbell’s thoughtful and entertaining speech provided the participants to understand the budget in a practical way through the premier’s eyes and vision for our province. This years budget put emphasis on social services, the issues surrounding homelessness, areas relevant to economic and cultural relationships with Asia, support for the arts and health care. The budget calls for an increase in health care funding from 9.36 billion in 2001 to 14.84 billion in 2008 and 16.54 billion by 2010. The province also lowered income tax rates from 21.3% in 2002 to 14.1% in 2008 for the average British Columbian. The increased budgets in certain sectors and decrease in income taxes is balanced by the implementation of a new Carbon Tax. The Carbon Tax will be applied to industries and consumers that utilize Carbon Fuels, and will ultimately be passed on to consumers. The final result of the increase in funding, decrease in income tax and implementation will be measured on the effect is has on British Columbia in the upcoming year. The Premier’s Luncheon proved to be an invaluable event for all participants.